A Hindustan Times report has revealed that Professor Bhullar maybe released from jail in as little as two months. The report cites Jasdev Singh Rai as the key negotiator with the Indian national security advisor Ajit Doval over several key issues concerning the Sikh community worldwide. Some of the issues that were discussed in prior meetings was the release of Sikh political prisoners, removal of ‘black lists’, and Akal Takht and Sri Harmandar Sahib’s sovereignty. If followed through, the talks would be considered a major breakthrough following 31 years of of “Standoff” between Sikhs and the Indian state. London: Devinder Pal Singh Bhullar, who has been in jail since 1995 after being convicted of a blast in New Delhi in 1993, is among several Sikh political prisoners likely to be released shortly, national security adviser Ajit Doval has informed a key interlocutor in official talks. Jasdev Singh Rai, who was the chief interlocutor during talks between a delegation of overseas Sikhs and Prime Minister Narendra Modi in London in November, has been informed that procedures for the release of 42 political prisoners have been initiated. After meeting Doval in New Delhi recently for a follow-up of the London meeting, Rai told Hindustan Times that the issues discussed included the release of prisoners, taking down of ‘blacklists’, and passports for families of those who had sought asylum abroad. The talks with Modi were described as a “major breakthrough after 31 years of standoff” between overseas Sikhs and the Indian state. Doval was asked at the talks to carry forward the dialogue. 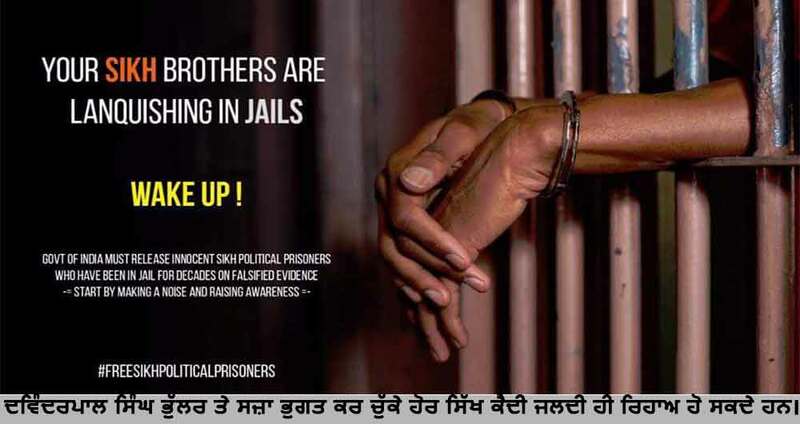 There has been a campaign for Bhullar’s release in recent years. Lal Singh, who has been on parole 24 times (in custody since 1992), is also a high-priority case, Rai said, and added that other cases were also discussed during the talks with Doval. Modi had promised to take down the so-called ‘blacklist’ that includes individuals who were involved in the Khalistan movement, and are unable to get Indian visas (many of them reportedly hold non-Indian citizenships). “Doval said he had instructed embassies across the world, especially in Europe, to take down the local lists, while those on the lists made by central agencies of India were being taken down as soon as possible. The government is going through these lists, reviewing them and taking them down,” Rai said. Doval, he said, suggested periodic meetings in Delhi with a delegation of Sikhs from across the world; the first to be held within two months. The meetings would include of officers from various departments of the Indian government. Rai said he would discuss with other Sikh organisations and set up a team, adding that the central issue in the discussions would be the ‘miri-piri’ issue of Harmandar Sahib and Akal Takht Sahib.